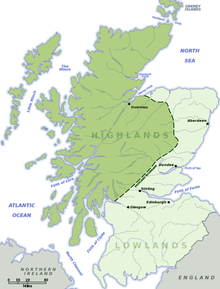 A map showing the Scottish Lowlands (in light green) and the Scottish Highlands (darker green). The Lowlands (Scots: the Lallans or the Lawlands; Scottish Gaelic: a' Ghalldachd, "the place of the foreigner") are a cultural and historic region of Scotland. In geological terms, the dividing line between Lowlands and Highlands is the Highland Boundary Fault. There was also a legally defined Highland Line in the post-Culloden years, part of the measures taken to suppress Gaelic culture. For other purposes, the boundary varies; but if the Boundary Fault is used, then the traditional Scottish counties entirely in the Lowlands are: Ayrshire, Berwickshire, Clackmannanshire, Dumfriesshire, East Lothian, Fife, Kinross-shire, Kirkcudbrightshire, Lanarkshire, Midlothian, Peeblesshire, Renfrewshire, Roxburghshire, Selkirkshire, West Lothian and Wigtownshire. Traditional Scottish counties which straddle the Boundary fault include Angus, Dunbartonshire, Stirlingshire, Perthshire, Kincardineshire, Aberdeenshire, Banffshire and Moray. Geographically, Scotland is divided into three distinct areas: the Highlands, the Central plain (Central Belt), and the Southern Uplands. The Lowlands cover roughly the latter two. The northeast plain is also "low-land," both geographically and culturally, but in some contexts may be grouped together with the Highlands. The term Lowlands is sometimes used in a more restricted sense to refer specifically to the Midland Valley. Much of this area, which has a characteristic structure of sedimentary rocks with coal deposits, lies within the basins of the Rivers Forth and Clyde. Historically, this valley has been the most agriculturally productive region of Scotland. During the 19th and early 20th centuries, coal deposits promoted concentrated industrial activity and urbanization in the Midland Valley, where 80 percent of the population of Scotland now live. While coal mining and other heavy industry have declined in the region, it remains at the centre of the Scottish economy, with electronics and computer manufacture and service sectors such as telecommunications, computer software, and finance. The southernmost counties of Scotland, nearest the border with England, are also known as the Borders. They are sometimes considered separately from the rest of the Lowlands. Many ancestors of the Scotch-Irish, as they are known in the United States, or Ulster-Scots, originated from the lowlands and borders region before migrating to the Ulster Plantation in the 17th century and later the American frontier, many prior to the American Revolution. The term Scottish Lowlands is used with reference to the Scots language in contrast to the Scottish Gaelic spoken in the Highlands, although historically also in parts of the lowlands, Scottish history and the Scottish clan system, as well as in family history and genealogy. ^ East Lothian was known as Haddingtonshire until 1921. ^ Midlothian was known as Edinburghshire until 1921. ^ West Lothian was known as Linlithgowshire until 1921. ^ "Lowlands region, Scotland, United Kingdom". Encyclopedia Brittanica.